Working in the technology sector is demanding, with the need to constantly keep on top of the game to be successful. Ensuring our studio and designers are equipped with the latest technology and equipment is one way we can do that. But what happens with the old stuff? What good can we do with it? Luckily for us, our close relationship with The Bananabox Trust gave us an opportunity to help those less fortunate, 13,000km away in Northern Malawi. The Bananabox Trust works with people and organisations in Malawi, to bring expertise and support to those in need. It all starts with a kind donation from a person, family or organisation in the form of a banana box, filled with goods that are not readily available in Malawi, and that would improve the quality of someone’s life. These boxes are then put into a shipping container, and transported through land and sea for a total of 3 months before finally arriving in Ekwendeni, a town in Northern Malawi. In an effort to help change the lives of those living in some of the poorest areas in the world, Blue2 & Avian sent out a banana box with the latest shipment. Included were over 10 laptops and other pieces of technology that would aid the recipient in making the best use out of their new computer. These laptops will make a massive difference for the people and local organisations that receive them. We know for sure that one of them is heading for a local hospital to be used to take blood pressure and record the data which is amazing news! 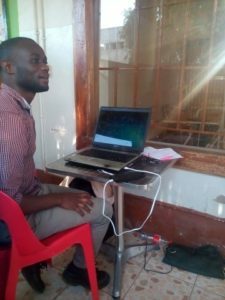 Also pictured is one of our donated laptops being used by a charity called Rehaat-Initiative in Ekwendeni, supporting youth empowerment in the community with IT skills and other projects. The container was slightly damaged at sea en route to Malawi but fortunately, most boxes, including the one with the laptops all managed to survive. The Bananabox Trust helps those in Northern Malawi through this amazing initiative but also work with local communities and projects to help make a difference. They work with the local community and partners God Cares. They have also established BEST of Friends. This non-profit organisation exists to improve the lives of the children at the Ekwendeni School for the Visually Impaired. Around 50 kids attend this school at any given time, all of them blind or partially sighted, many of them albino. If you’d like to read more about the efforts of the charity and the work they do, you can visit their website here. 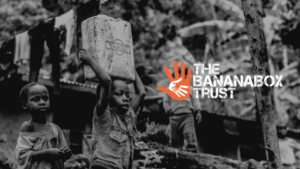 If you fancy going one generous step further by making a donation or enquiring about the banana box process, simply get in touch through this link. Alternatively, you can contact us at Blue2 and we would be more than happy to send you in the correct direction.